This is 2018 and the thing that most people don’t have is time. Website speed has become more important than ever in 2018 for both your conversions and SEO. According to Google- “53% Users abandon a site that takes over 3 seconds to load”. Amazon would lose over $1.6 billion if it slowed down by even 1 second. And you will lose your 50% of your mobile traffic and lots of leads if your site takes more than 3 seconds to load. There are multiple reasons why website load time is so important for your business. The more time your site takes to load, the more conversions you lose. As stated earlier- 53% of mobile users abandon a site that takes more than 3 seconds to load. So if your site takes more than 3 seconds to load you are losing 53% of your potential customers. That’s why speed is so important for your business website. Slow websites kill conversion. The simple reason behind this is people don’t have time and they expect sites to load fast. Suppose, you are hungry and you go to a specific restaurant for the first time. You place an order and then wait for the food to come. But what if the restaurant takes so much time to serve you your food? You are hungry so obviously, you will feel disappointed with the restaurant service. You had a bad experience there because of their delay in serving food. The restaurant’s first-time impression on you was bad. You would not like to go to that restaurant again or maybe you would advise others not to go there. Same is the case with a website. A website that takes ages to load gives a bad user experience. Such a website will have a high bounce rate and this can damage your word of mouth marketing efforts. The most solid reason why you should consider optimizing your website for speed is SEO. Google announced this back in the year 2010 that Google does takes speed into consideration while ranking websites. Speed matters in SEO. No matter how great your content is, if your site is super slow then nothing is going to work. You will lose your rankings if your site takes much time to load. Slow speed affects your rankings and conversions negatively. It’s time you start paying attention to your site load time. Before you take some steps to improve your website speed, you should first know what site load time is considered as good. Make your site as fast as you can. You would be surprised to know that our site (SEOliquido.com) takes only 613 milliseconds to load in the UK thanks to a good web design and a careful SEO. Isn’t this amazing speed? The faster your site is the more good it will do for you. But when we answer this question while taking Google into consideration then, if your site loads under 3 seconds then your rankings will not be affected negatively. 1. 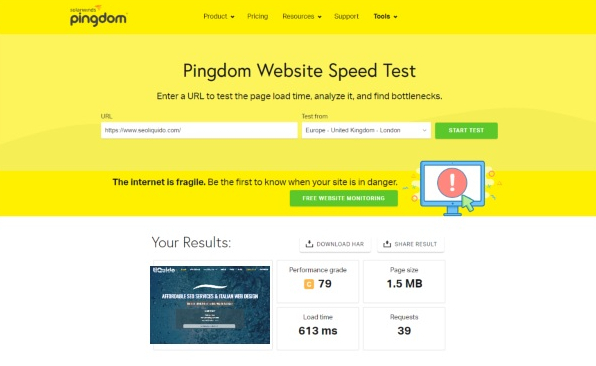 Pingdom – This tool is really amazing and one of the best for checking website speed. With this tool, you can test your website speed from many regions like America, India, UK, Japan etc. 2. Google page speed insights – A tool by Google, al free to use. With this tool, you can check your website speed and you can also see the level of optimization for speed your site has. The Tool will also recommend you some ways to reduce your site load time. 3. Yslow – This tool tests your website speed and offers some advice on how to improve your site load time. Your site load time depends on how fast your server responds. When you host your site on a shared server that is when you opt for shared hosting, you share all your server resources with others ultimately making your site load slow. You should consider using VPS hosting that uses multiple servers for content distribution. VPS hosting is best suitable for small and medium-sized businesses as well as bloggers. Another option is going for Dedicated server hosting which can be quiet expensive. But if you have got a big budget, probably this is the best option for you. In case, you cannot afford to host your site on VPS or Dedicated servers, there is yet another option for you. Choose managed WordPress hosting plan for your site rather than the usual economy or deluxe plan. In order to make sure your server responds fast, you should consider going with some of the best and fast hosting service providers like Bluehost, HostGator and A2hosting. Install a caching plugin to your WordPress website as to enable browser caching. This is the fastest and simplest way to speed up your website. Some caching plugins for WordPress are WP super cache and WP total cache. If your site is on WordPress and you are using a pre-built theme, then I would recommend you to use a fast loading theme with clean code. Free themes are generally written by amateur coders and thus are less likely to be reliable. The better option is to go for a premium theme that loads fast like. For minifying your pages, you can use some WordPress plugins like WP minify. Most of the times, Images have the most share in a webpage size. So your website cannot be made fast without optimizing images. The way to optimize images for speed is to compress them. Compression reduces the page size by eliminating unnecessary elements from the image. For compressing your images you can use some WordPress plugins like Shortpixel and WP Smush. Content delivery networks are the best way to make your site load fast in every part of the globe. How fast your site loads also depends on the location of the server. A site hosted in the UK will load faster in London than in Tokyo. A content delivery network solves this problem by distributing your website files across a wide network of servers located in different parts of the world. The best pay CDN service to use is MaxCDN. A free alternative is Cloudflare. Too many HTTP requests slow down your website. the more requests are being made to your server, the slower it’ll take your website to load. When you enable expire headers, it tells the user browser when to request files from the server and when to request the file from the browser cache. This reduces the requests made significantly thus improving your site speed. GZIP compression is used to reduce the size of files on your computer significantly. For example, GZIP compression can compress a 60 MB file into a 5 MB zip file. For websites, GZIP compression can compress all your website files in Zip files. This results in very small file sizes thus improving your site speed. “Keep alive is a method to allow the same TCP connection for HTTP conversation instead of opening a new one with each new request. More simply put, it is a communication between the web server and the web browser that says “you can grab more than just one file at a time”. Keep-alive is enabled using the “Connection: Keep-Alive” HTTP header. PHP is useful but many times it can contribute to slower websites. Try to use an HTML file instead of PHP whenever possible. Another option for you is to use PHP accelerator to make your website much faster in case if it relies a lot on PHP. Google is on a mission to make the whole web fast. Your business relies a lot on Google so it becomes vital for you to co-operate with them and make your website load faster. Optimizing your website for speed will do a lot good for you like improving your conversions and preventing your rankings from dropping due to slow load time. Website speed is one of the hundreds of SEO ranking factor that you should care about.